How about some seasonal cards today? It's "officially" Fall now, and I've put up my Fall decorations. I love this season. The crisp, cool air, caramel apples (just had one today - yum! ), and the beautiful colors. What's not to love? So in honor of the season, I have some cards to inspire you. 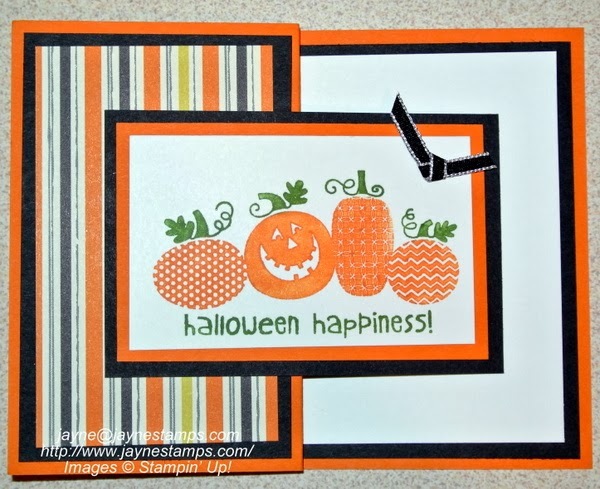 This card is from the Upscale Swap Group and made by Candy Leggett. She used the Halloween Happiness stamp. Aren't those pumpkins just the cutest? This was a card I received at Convention. There's no name on the back to know who made it. 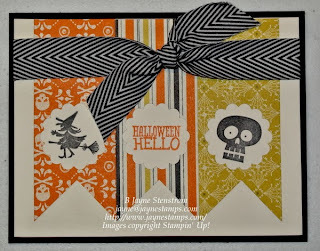 I do know that the stamp set is Halloween Hello and she used the Witches' Brew Designer Series Paper. I absolutely LOVE this card made by Judi Cayton from the Upscale Swap Group. Mostly because it came with CHOCOLATE in it! And would you believe I haven't eaten it? (That's only because I already have some of these candy bars...) Not that I wouldn't share you know. 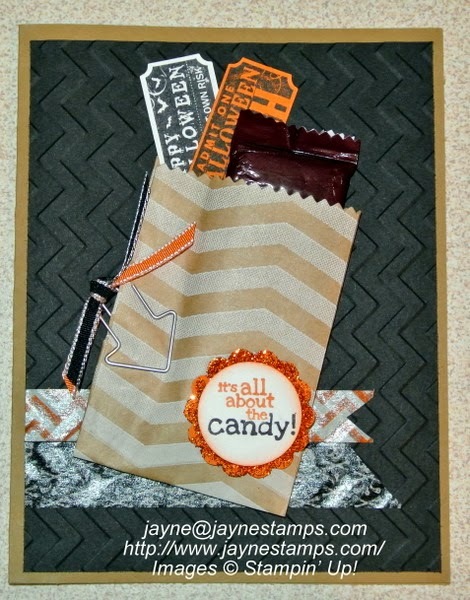 She used Halloween Hello, Halloween Bash, and That's the Ticket stamp sets. There's the Witch's Brew Washi Tape, Orange Glitter, Hang Up Cute Clips, and the Tag A Bag gift bags. The bags in the Tag a Bag are actually much larger than this one. This was cut down into four mini bags. She used the Finishing Touches Edgelits to make the top edge look like a bag edge. Wasn't that clever? 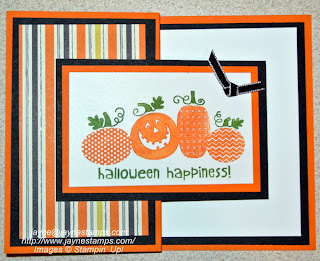 What fun Halloween cards! Love them and the little jumping widgets. Too cute!